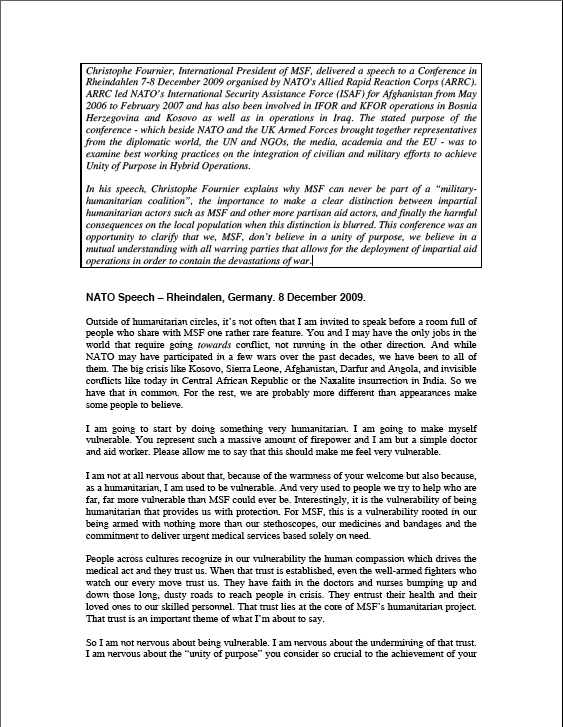 Christophe Fournier, International President of MSF, delivered a speech to a conference organized by NATO's Allied Rapid Reaction Corps (ARRC) in Rheindahlen, Germany, in December 2009. ARRC led NATO’s International Security Assistance Force (ISAF) for Afghanistan from May 2006 to February 2007 and has also been involved in IFOR and KFOR operations in Bosnia Herzegovina and Kosovo as well as in operations in Iraq. The stated purpose of the conference - which beside NATO and the UK Armed Forces brought together representatives from the diplomatic world, the UN and NGOs, the media, academia and the EU - was to examine best working practices on the integration of civilian and military efforts to achieve Unity of Purpose in Hybrid Operations. In his speech, Christophe Fournier explains why MSF can never be part of a “militaryhumanitarian coalition”, the importance to make a clear distinction between impartial humanitarian actors such as MSF and other more partisan aid actors, and finally the harmful consequences on the local population when this distinction is blurred. This conference was an opportunity to clarify that we, MSF, don’t believe in a unity of purpose, we believe in a mutual understanding with all warring parties that allows for the deployment of impartial aid operations in order to contain the devastations of war. Outside of humanitarian circles, it’s not often that I am invited to speak before a room full of people who share with MSF one rather rare feature. You and I may have the only jobs in the world that require going towards conflict, not running in the other direction. And while NATO may have participated in a few wars over the past decades, we have been to all of them. The big crisis like Kosovo, Sierra Leone, Afghanistan, Darfur and Angola, and invisible conflicts like today in Central African Republic or the Naxalite insurrection in India. So we have that in common. For the rest, we are probably more different than appearances make some people to believe. I am going to start by doing something very humanitarian. I am going to make myself vulnerable. You represent such a massive amount of firepower and I am but a simple doctor and aid worker. Please allow me to say that this should make me feel very vulnerable. I am not at all nervous about that, because of the warmness of your welcome but also because, as a humanitarian, I am used to being vulnerable. And very used to people we try to help who are far, far more vulnerable than MSF could ever be. Interestingly, it is the vulnerability of being humanitarian that provides us with protection. For MSF, this is a vulnerability rooted in our being armed with nothing more than our stethoscopes, our medicines and bandages and the commitment to deliver urgent medical services based solely on need. People across cultures recognize in our vulnerability the human compassion which drives the medical act, and they trust us. When that trust is established, even the well-armed fighters who watch our every move trust us. They have faith in the doctors and nurses bumping up and down those long, dusty roads to reach people in crisis. They entrust their health and their loved ones to our skilled personnel. That trust lies at the core of MSF’s humanitarian project. That trust is an important theme of what I’m about to say. So I am not nervous about being vulnerable. I am nervous about the undermining of that trust. I am nervous about the “unity of purpose” you consider so crucial to the achievement of your objectives. This is a “unity of purpose” MSF believes is harmful to this trust. It casts doubt upon our integrity as humanitarians because people may doubt our motives or our objectives. That is why I am nervous, and that is what I would like to talk about today. Treated 212,000 children for severe acute malnutrition. These are significant numbers for a non-governmental organization, especially in our eyes because we know the people and patients behind those numbers. Yet still I can tell you as president of MSF that I am not happy with these results. I am not happy that in Somalia our programmes are dwarfed by the massive needs of those war-ravaged communities. I am not happy that we struggle to be meaningfully operational in key conflicts like Darfur, Pakistan and Iraq. And I am particularly not happy that the needs of tens of thousands of sick, malnourished or wounded Afghans continue to require urgent humanitarian relief that we are unable to deliver. Prior to the murder of five colleagues in Baghdis in 2004, MSF had worked continuously in Afghanistan since 1980. In the early-2000s we were running activities in Afghanistan in half of the provinces. Today, circumstances force us to be much less present. We have recently opened two programmes, one in a hospital in the East of Kabul and another in Laskargah, the capital of Helmand Province. There are many factors explaining our limitations in Afghanistan. One of those factors is this concept for the title of this conference: Unity of Purpose. Before going further I want to reassure you that MSF is neither pacifist nor antimilitary. That may sound strange for an organization that was awarded the Nobel Peace Prize a decade ago, but we are not pacifistic. We do not stand in judgment of either your objectives or those of your enemies. We stand, MSF and NATO, in the same volatile geographic location, so we must deal with the reality of our coexistence in the tight and tense corridors of war. While we will never have a common purpose, we need to improve our mutual understanding in order to be clear about our different motivations, responsibilities, strategies, and purposes. 1. Our purpose is to limit the devastations of war. I’ve talked many times with our Afghanistan mission team and it seems that at every encounter between MSF and NATO (most of them good, productive encounters) the NATO representatives say something at the end like “at least we share a common goal.” It seemingly doesn’t matter whether this is with your local commanders in the field or with policy makers in Brussels. “At least we share a common goal”: What does that mean? I can assure you it leaves all of us at MSF with a profound sense of being misunderstood. Confused and manipulated as it has become (and I’ll come back to that), we believe the humanitarian project is a fairly simple one and very limited one. Our goal is to help people survive the devastations of war. That means finding and caring for those most in need – those caught in the crisis of conflict who are suffering illness, wounds, hunger, grief, and fear. We respond by delivering aid that saves lives and alleviates suffering here and now. As I said, our ambition is a limited one. Our purpose is not to bring war to an end. Nor is it humanitarian to build state and government legitimacy or to strengthen governmental structures. It’s not to promote democracy or capitalism or women’s rights. Not to defend human rights or save the environment. Nor does humanitarian action involve the work of economic development, post-conflict reconstruction, or the establishment of functioning health systems. Again, it is about saving lives and alleviating suffering in the immediate term. This marks a fundamental difference between our two ways of thinking. What you do in Afghanistan today is for the Afghanistan of tomorrow. What we do in Afghanistan today is for today. We heal people for the sake of healing people. All of these other activities (reconstruct the country, promote democracy, etc) might be worthy of praise. They may even be exactly the sort of activities that NATO and NATO countries should be promoting in Afghanistan. But they are goals and activities which fall outside of humanitarian ones. Related? Yes. But outside. More importantly, when humanitarian goals and activities are lumped together with this larger, broader and more future-oriented agenda, the direct result is confusion and even contradiction. The indirect result is that civilians in conflict do not receive the assistance to which they have a right. I want to urge that you do not confuse MSF’s position today with any sense of moral judgment or superiority. We do not believe humanitarian objectives are more noble than military ones in a place like Afghanistan. I can assure you we have no opinion on the legitimacy of NATO spending the next 100 years in Afghanistan. Or leaving tomorrow. Or, it should be clear, of the Taleban regaining control of the State. In other words, we are not on your side. We are not on any side. That is the principle of neutrality. We neither support nor oppose parties to a conflict, regardless the justice or brutality of their actions. This is the reverse of your position. 2. In order to be accepted by all belligerents, we are committed to a policy of neutrality and impartiality. Humanitarian aid must address human beings regardless their side with regard to the frontlines or warring parties; no matter their race, religion, ethnicity or allegiance. That is theprinciple of impartiality. It constitutes the sine qua non of humanitarian action. The duty of impartiality comes to humanitarian organizations from the Geneva Conventions, which bestows certain rights and protections upon “an impartial humanitarian body”. Impartiality means MSF must have access to all civilian populations, in order to identify and treat those most in need. Obviously, decisions of where and how to intervene is thus based on our own independent assessment of health needs. Just as obviously, it cannot be based on the need for stabilization, reconstruction, state-building, winning hearts and minds, force protection, or winning support in publics back home. As a soft target, to have access requires us to be accepted not just by local communities but by all armed parties in the conflict area: national governments, armed oppositions movements, international forces, private security forces, criminal gangs, and so on. These parties must recognize MSF as a neutral health actor providing useful services. That means life-saving assistance with no ulterior agenda. Actual impartiality and neutrality are of course important, but MSF must equally safeguard the perception of these principles. Here is why independence – and the perception of it – is so important. Can you imagine MSF convincing the Taleban of our neutrality if our operations were funded by your governments? For that matter, can you imagine the reverse? A health organization working in London or New York or Copenhagen and funded by the Taleban? I am guessing your governments would be more than just suspicious, and would take serious measures against such an organization. So you see the difficulties of MSF gaining acceptance in today’s Afghanistan. That is the reason for our strict independence from the Western governments, especially those who are a party to the conflict. That includes financial, logistical and operational independence as well as an independence of purpose. 3. The very idea of a “humanitarian war” or “military-humanitarian coalition” is in total contradiction with the core idea and the modus operandi of the humanitarian enterprise. The challenges to acceptance and access begin at the macro level, at the level of the intervention itself. The involvement of the military in aid delivery is nothing new. It has long been a standard component of counterinsurgency strategies. And we see it in response to natural disasters such as the December 2004 tsunami. Yet there is a growing change towards something loosely labelled “humanitarian war”. This concept became more distinct with the NATO intervention in the rebellious Serbian Province of Kosovo. Any interventions must ultimately be based upon threats to international peace and security. In Kosovo, though, the public discourse shifted, with an emphasis upon the foreign military invasion as having a humanitarian goal, like a response to people’s suffering. Troops were primarily portrayed as care givers to the massive numbers of refugees fleeing Serbia. For MSF, “humanitarian war” is a dangerous corruption of the humanitarian ideal. It supports the view that the use of violence is a legitimate way to deliver humanitarian assistance. It also confuses two profoundly distinct human endeavours. [This bellicose “humanitarian” intervention marks a curious reversal of history. The original intent of the humanitarian project was to “civilize war” – through the distinction between combatants and non-combatants. Now we have come to waging “wars for civilization”.] Although humanitarian actors such as MSF are not opposed to war, we are strongly committed to non-violent modes of action in the delivery of aid. “Shoot to feed” or “shoot to heal” is abhorrent to our modus operandi. We well understand the need for countries or organizations such as NATO to obtain popular support and political consensus for an overseas intervention, especially going to war. In this matter, the humanitarian rhetoric can be quite useful, as it puts forward a moral appeal of near universal value. In the end, though, portraying military interventions as humanitarian creates a continuity between two opposites. On one end, the impartial provision of urgent health and humanitarian services. On the other end, the policies of regime change, foreign occupation, pacification, state building and violence. Such a continuity undercuts trust. 4. Being accepted by all belligerents tends to be more difficult in conflicts where UN or western troops are involved. At the country level, in a place such as Afghanistan, the challenges to acceptance and access are as plain as the noses of our faces. Contrary to a common knowledge, our experience shows that acceptance by all belligerents tends to be more difficult where UN or western troops are involved in the fighting. One-sided assistance means one-sided access. Afghanistan today is a good example of this difficulty. The breach of trust in Afghanistan comes from the fact that our organization originates from the very same countries that decide upon, finance and furnish the troops you command. In short, if you except the battle dress, we look like you. Our claim to act independently from our countries of origin, who are so politically and militarily-engaged, is naturally met with strong skepticism by local actors, especially by those hostile to the international intervention. This lack of trust is all the stronger when UN and/or western militaries claim to use military force in furtherance of “humanitarian” goals, thereby unilaterally pronouncing a unity of purpose between humanitarian NGOs and intervention/occupation forces. In 2001 no less than Colin Powell proclaimed "NGOs are such a force multiplier for us, such an important part of our combat team." Even more unhelpful, humanitarians have been labelled as sources of information. It should be obvious to you in the military that if we are part of your team, if we are on your side, if we are providing you with information, if we are advancing towards the same goals as you, then we fall directly into the crosshairs of the other side. It’s nothing personal, but we can’t afford this sort of unity. Looking more at the community level, in places like Afghanistan the actions of our fellow NGOs reinforce the confusion of roles and purposes I’ve just described. The aid system is very diverse. The vast majority of aid agencies have broader objectives than limiting the devastation of war. Often announcing themselves as humanitarian, they are actually geared towards supporting peace, good governance, justice, sustainable development, gender equality, and so on. In Afghanistan, many are sponsored by belligerent parties to the conflict. That means they are funded by governments whose aid policies openly declare that such financing is in direct furtherance of their foreign policy objectives. Within this framework, it is easy to understand the perception that aid agencies contribute to the international war effort and state building policies of one side and one side only. In Afghanistan, what we see is that the massive resources of the aid system, both UN and NGO, support the Afghan government and the objectives of the Western intervention forces. Looked at critically, the aid system in Afghanistan operates as an implementing partner of your counter-insurgency, pacification and state-building policies. It’s not just the NGOs and the UN. Non-aid actors such as the military have spent enormous resources on the delivery of aid. Essentially, you have portrayed yourselves as somehow part of this humanitarian project. Again, we do not judge your course of action, but there are consequences. Crucially, beyond our concern for the integrity of humanitarianism, there is a pragmatic issue: the negative consequences on the local population. The moment the humanitarian project becomes militarized, either in terms of its modus operandi or its public perception, is the moment when the humanitarian project becomes a military target. That militarization of, say, a specific hospital or healthcare programme may be a matter of fact. For instance when your armed teams provide security or care itself. Or that militarization of a specific hospital or healthcare programme may be a matter of perception because of the way it is done in other locations. Either way, the results are potentially lethal. So whether or not this targeting is legitimate doesn’t matter. The point is that when some schools or health facilities or aid convoys become militarised by one side, they all become potential targets by the other side. No humanitarian NGO can work under such conditions. In Afghanistan this dangerous phenomenon has been illustrated on many occasions. ISAF protection of health personnel and facilities has contributed to turning the latter into a battle ground with armed opposition groups. The result is that patients who need of care are afraid to go to these facilities. They fear an attack on the facility. They also fear retribution (retaliation) for having used these services. In too many communities, people are hence left with the impossible choice of watching a child suffer without treatment or risking a night visit from the armed opposition. For MSF, negotiation, not firepower, is the key to security in our health facilities and our access to people who need urgent help. That is why our policy is to enforce a “gun free zone” within our premises and vehicles; and to obtain from all belligerents a commitment to recognize MSF health structures, ambulances, offices and homes as “demilitarized sanctuaries” and thereby off-limits from combat, police, and intelligence operations. 5. The partiality of the UN and the aid system toward NATO/OER/GoA and the direct involvement of military unit in aid operations are not condemnable per se as long as they do not jeopardize population access to essential services. You’ve heard that we oppose the notion of “humanitarian war.” And you’ve heard that we are critical of placing aid in service to military objectives. It may surprise you, then, that we have no principled objection to military units delivering aid as part of the war effort. We don’t have any principled objection to aid being part of hearts and minds campaigns or of UNAMA and aid agencies supporting the Afghan government. But we would like to underscore two points. First, aid efforts undertaken to assist counterinsurgency strategies or build the state cannot be impartial because they are not based with an exclusive eye upon need. Such aid should not be attached to the term “humanitarian”. Second, and most importantly, counter-insurgency and state-building aid policies have a poor record of meeting the vital needs of civilians in a conflict situation such as Afghanistan. Aid doesn’t go to those most in need because it is directed by other priorities. For example, the military and political priorities of the Afghan government and its allies do not cover much of the country today. In Kabul itself the level of public and internationally supported primary health care facilities is highly insufficient. Why? Because while the population of Kabul has quadrupled since 2001, it is not considered a priority in terms of counter-insurgency. Given their partisan stance on one side of the conflict, and given their funding by NATO countries, most aid agencies are considered de facto targets by armed opposition groups in Afghanistan today. It does not matter that their aid is vitally needed by local communities. In the end, since 2006 and the expansion of hostilities to much of the country, the majority of Afghan population lie out of reach to aid providers. That is the consequence of this perception that we all share the same unified purpose. In conclusion, I would like to thank you for this important opportunity to exchange views on the distinct roles and functions of our organizations. I could understand MSF’s position is perhaps unfair to you, as this speech is more of a monologue. We welcome a dialogue between our organizations. And I invite you to talk with Arjan Hehenkamp, one of our senior operational directors, and myself. Before sitting down, though, I’d like to be clear on a few points. First, I want to reaffirm the need for impartial aid operators to be allowed to act independently from the government, NATO, UN, OEF as well as AOG security agenda. Third, we don’t want to oppose the “virtue” of a humanitarian aid driven by impartiality to the “cynicism” of aid driven by counter-insurgency and state building imperatives. We just want to underline that we measure aid by humanitarian standard. That standard is whether aid meets the vital needs of those civilians most in need, across the entire country, and not whether aid meets other objectives. An abstention of the use of force against demilitarized health or humanitarian structures, vehicles and premises. A commitment not to arrest or seek information from patients during their stay in our facilities. Fourth, to underline the importance in NATO public discourse and its modes of deployment to maintain an explicit distinction between two types of aid actors – partisan deliverers of relief and impartial humanitarian actors. Finally, I’d like to read you a paragraph from US Army, Joint Publication 3 – 57. The paragraph explains “Civil-Military Operations” and reads: “The activities of a commander that establish, maintain, influence, or exploit relations between military forces, governmental and [civilian NGOs] … and the civilian populace in a friendly, neutral or hostile operational area in order to facilitate military operations, to consolidate and achieve US objectives.” I hope my presentation leaves you with a much better grasp of why such words leave me nervous. They leave all of us in MSF nervous. This mutual understanding is important to us. While MSF may not believe in a unity of purpose, we think that the more recently promoted unity of understanding would be closer to the reality than the unity of purpose idea. Yes, a common, or, better said, a mutual understanding with all warring parties that allows for the deployment of impartial aid operations in order to contain the devastations of war is what we are looking for. Thank you.